Seven segment displays are LED displays that can show numbers 0 to 9. They are made up of seven LED "segments" and may also have a extra LED used as a decimal point. The seven segments are labelled a to g and the decimal point is usually labelled DP. When more than one seven segment display is used, larger numbers can be displayed. 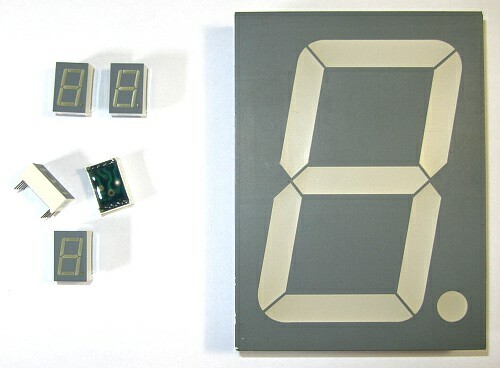 The photo below shows various sized seven segment displays. 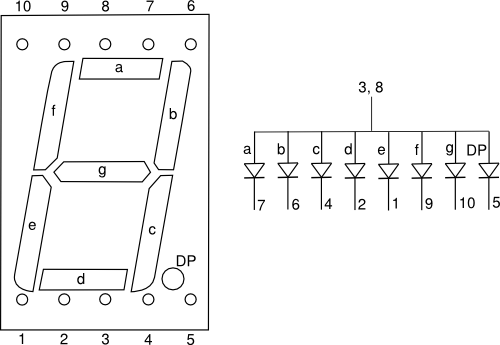 Seven segment displays usually join all the cathodes or all the anodes of the LEDs in the display together. When all the cathodes are joined, the display is called a common cathode seven segment display. 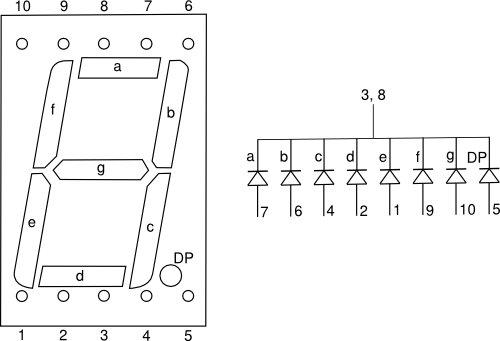 When all the anodes are joined, they are called common anode seven segment displays. Pin numbering of 7-segment displays can differ between different devices so always be sure to check the manufacturer's datasheet for the display that you are using. A common configuration for two displays is shown below with the wiring of the LEDs.